Simple Audio Roomplayer+ review | What Hi-Fi? It’s been two years since we last saw the Simple Audio Roomplayer. In that time, it’s added a ‘+’ to its name, introduced support for high-resolution music up to 24-bit/192kHz (up from 24-bit/96kHz) and brought in the direct NAS-drive support its predecessor was lacking. Not that you can tell by looking at it – its design has stayed largely unchanged; it remains a sturdy, yet elegant combination of aluminium and tempered glass. It’s a rather different proposition from the all-in-one multi-room speaker designs offered by the likes of Pure and Samsung, and you’ll have to add in your own speakers for the system to work. We used a pair of Q Acoustics 2020is. 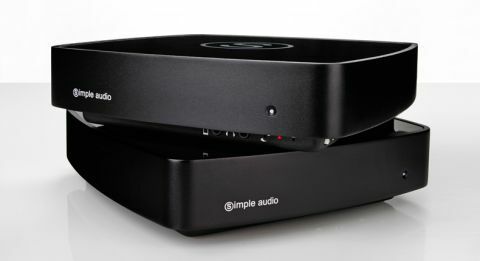 The Roomplayer+ with Amp (£700) is the unit we’ve tested. It contains a Class D amplifier and a claimed 2 x 50W output. There is also the option for the Roomplayer+ without amp (£600) that connects to an existing system. On the back of the unit, you’ll find speaker outs, line-level inputs and outputs, a subwoofer out and both optical and coaxial outs. There are also ethernet and USB ports. Tucked low on the front are two 3.5mm sockets, one for headphones and one for connecting a phone or tablet. You’ll need to provide your own speaker cables, but in the box you’ll find phono-to-phono, phono-to-3.5mm, 3.5mm-to-3.5mm and ethernet cables, which should cover any other connections you need to make. Simple Audio uses a system called ‘Powerline’, which is built into each of its units. This uses the regular mains power supply to deliver data to speakers in place of regular wi-fi. Simple Audio says this can offer data rates of up to 200mbps, ensuring high-resolution music is played back without issue. To get the Roomplayer+ system online, you’ll need to hardwire your master unit to your router or opt for a Roomplayer Bridge if this isn’t possible. Pairing between the Bridge and the Roomplayer(s) requires a simple series of button-pushes – we were up and running within a few minutes. You will need to download a desktop app for your PC or Mac to finish the set-up though, which seems somewhat long-winded considering most of the Roomplayer+’s rivals offer set-up through a tablet or smartphone app. Here it will let you set up all your music shares from local network sources such as iTunes libraries and NAS drives. You will also be able to plug in your information for the numerous streaming services it offers, which include Deezer, Qobuz, WiMP and TuneIn Radio – but not Spotify. If you’re happy using the desktop, we’d recommend sticking with it because controlling the service from a mobile device is currently rather limited. One nice feature of the Simple Audio Roomplayer+ is the ability to create user profiles, so different people can add their own music libraries. When it comes to performance, the Roomplayer+ benefits from its ability to play high-res music; a 24-bit/96kHz download of Dire Straits’ Walk Of Life is delivered with notably more detail than its non-high-res competitors. The chords in the uptempo keyboard melody are layered and three-dimensional, and there’s a precise handle on rhythm and timing that ensures everything is well organised. The bass is punchy and well controlled, while the treble is clear and open, producing a clean, balanced sound that works well with all genres of music. You get a wonderful feeling of space from the wide soundstage too, which fills our listening room with ease. Despite this, there’s something about the Roomplayer+ that doesn’t quite hold our attention. Even though there’s more detail here than with many competitors, it lacks the ability to uncover the textures, dynamics and nuances that make a piece of music truly engaging. Play a 24-bit/192kHz copy of Hans Zimmer’s Gotham’s Reckoning and it falls short of delivering the edge and urgency of rival system Bluesound, for example, lacking that last layer of expression and fine detail that really draws us in. And herein lies the Roomplayer+’s biggest problem – it faces excellent competition, at £100 cheaper, in the shape of the Bluesound Powernode. And that’s not a saving to be sniffed at. But with good speaker pairing, the Roomplayer+ is still an excellent-sounding system that’s very much worth an audition. However, to score the full five it needs to put a touch more thought into its audio, not to mention get its mobile and tablet apps working properly across the board for the full experience.